As new CEO, Satya talks about what he’s doing to reignite and redefine the mission of the company. It’s an engaging read. Satya talks about his origins with his family in India. He talks about family experiences that have led to his increased empathy. He shares his view of how Microsoft accomplished its original mission, lost its way somewhere in between, and now seeks to define itself in key areas. These include cloud computing, augmented and mixed reality, and quantum computing. In these latter categories, he is bold in stating where Microsoft will play and what it will accomplish. 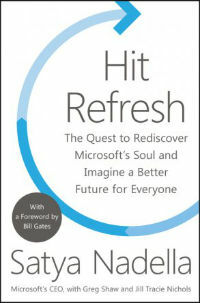 It’s a good read for a technologist or someone interested in Microsoft.